This was probably my best pull out of a random blaster box of 2018 Topps Fire - this is from the 4-card Gold Minted bonus pack included in each blaster. I've tried to stay away from blaster box purchases, because they seem like a tease of miscellaneous cards rather than something relatively fulfilling - as is, I kind of liked what these cards looked like, particularly the parallels that seem to pop. 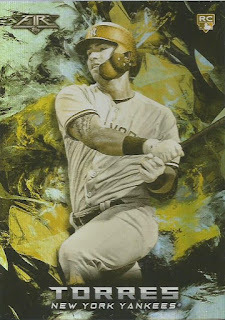 Impulsively, maybe what I’m looking for is a product that reflect the here and now - I want something that looks a little different, a little spacey as opposed to a product that uses a retro design [Topps Heritage, Topps Gypsy Queen, Topps Allen and Ginter, Topps Archives] and/or a product that doesn't really stray from what a baseball card looks like [Topps Flagship]. Topps Fire will never be the product of the year or anything - but maybe worth at least a couple of more looks. The think I've liked the most out of Fire so far are the inserts. I haven't seen any in person yet, but it looks better than last year and has potential to be something different. I always like the looks of this set, although worry if it keeps coming out it's going to have the Allen & Ginter/Gypsey Queen issue I personally have of all the sets blending together and looking the same and not knowing which year is which. Still, the cards do look cool. I love that Gleyber! Nice pull there.